Chris Brokaw and Jimena Bermejo performing on Anns Street, Belfast, May 2018, as part of BBEYOND PerformanceArt. (Info here.) Photo by Jordan Hutchings. New cd "The Hand That Wrote This Letter" out November 2017 on Capitan. Chris will be playing guitar with The Lemonheads on their 2018 Australian tour. These will be the band's first shows in two and a half years. Evan Dando and Chris will be singing and playing guitars, Farley Glavin playing bass, Mikey Jones playing drums. The dates include club shows and mini-festivals with other bands. Dublin, Ireland, at the Irish Film Institute. Experimental filmmaker Peter Hutton (1944-2016) is renowned for his silent cinematic portraits primarily of landscapes and cities. Chris and Dublin guitarist/composer Matthew Nolan will present some films in their original/silent state with others featuring new live scores for electric guitars and electronics. Event details here. Cambridge, MA, at Blue Bag Records. Chris writes: "6 months ago I released a cd called "The Hand That Wrote This Letter", a collection of David Bowie and Prince songs for classical guitar. I'll be playing a set of these tunes June 5 at Blue Bag Records in Cambridge, along with Jagtime Millionaire and Joseph Allred. 8pm. I'll be playing early. Come on down!" Details here. Stavanger, Norway, at Imir Scene Kunst. Hear See Visual Concert Series #2, in collaboration with NyMusikk. CB up first with solo songs set, Iver Findlay bringing visuals, 2nd up Golden Oriole duo set (Kristoffer Riis and Thore Warland) also with Iver, 3rd up CB again live score to Peter Hutton epic 'Skagafjordur' + In Titan's Goblet + NY Portrait Chapter 1 in silent state. Hear See is a visual concert series at RIMI/IMIR that presents a cross pollination between live music and visual mediums, where one can see the sound and hear the sights; details here and here. The MVF are Elisha Weisner (Kahoots) on guitar + vocals, Bob Weston (Shellac + Mission of Burma) on bass + vocals, Chris on drums + vocals. Listen and buy here. Washington, DC, at The National Gallery of Art, 2:30pm: Chris and Matthew will present new musical scores for a selection of works by American filmmaker Peter Hutton (1944 – 2016), alternating between films in their original silent state and ones with live scores for guitars and electronics. Free and open to all! Details here. Chris and Thalia played together in the Matador band Come in the 1990s. In the years since they have remained friends and occasional collaborators. On this tour, Chris and Thalia will be playing both solo sets and together. Most of the shows will be in private homes (or loft spaces, community spaces, art galleries, etc. ), with ticketing by Undertow Music. Athens, GA, at the 40 Watt Club, for Henry Owings 50th birthday extravaganza, w/Arcwelder, Elf Power, Velvet Monkey, and more, details here). Atlanta, GA, for Henry Owings 50th birthday extravaganza, w/86, Dead Now & Purkinje Shift, and more, details here). Brooklyn, NY, at Union Pool, with very special guests tba. 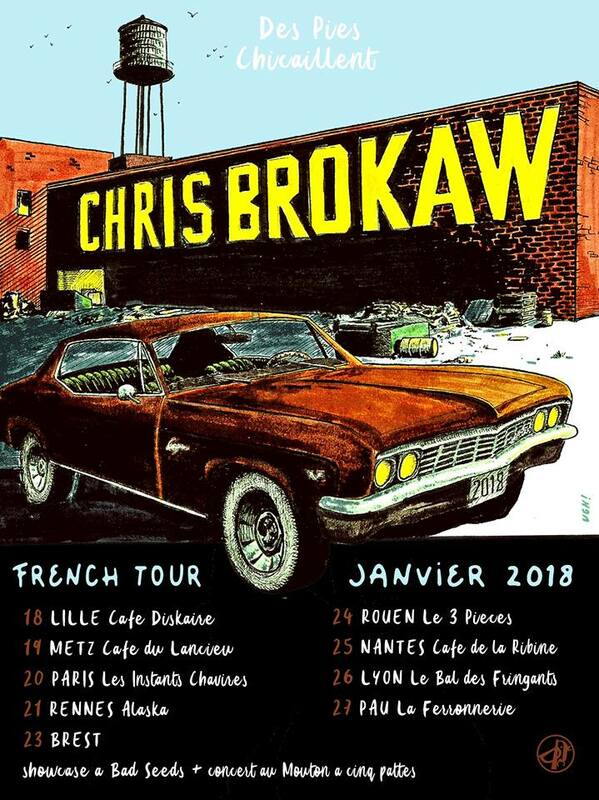 Chris' January-February 2018 European tour included dates in France. Chris began playing solo in late 1999. 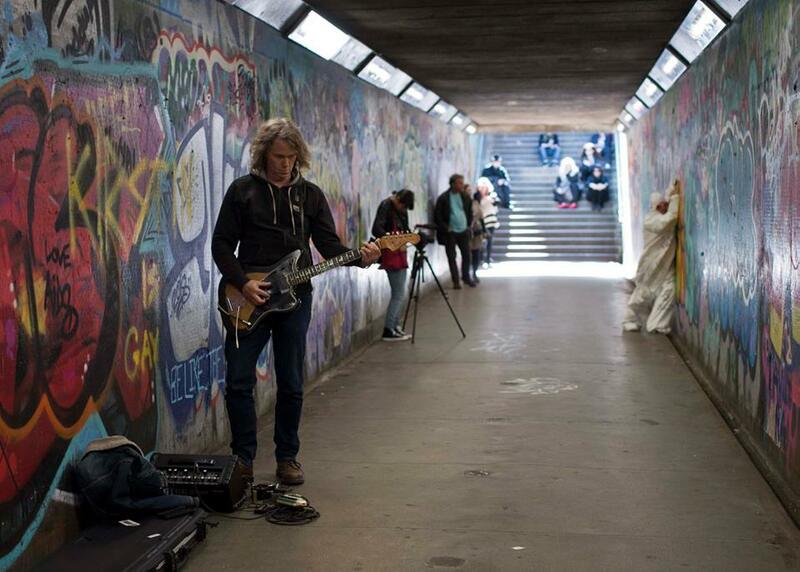 His shows feature solo electric guitar and tambourine, vocals, and acoustic guitar. His solo records include "Red Cities" (2002), "Wandering as Water" (2003), "My Confidante + 3" (2004), the original film score "I was Born, But. . ." (2004), "Incredible Love" (2005), "Canaris" (2008), "VDSQ Solo Acoustic Volume Three" (2009), "Gambler's Ecstasy" (2012), "'Now, Forager' Soundtrack" (2014), "The Periscope Twins" (2015), and "The Hand That Wrote This Letter" (2017). Since 2005, he has performed occasionally with the CHRIS BROKAW ROCK BAND, first with Jeff Goddard (ex-Karate) on bass and Kevin Coultas (ex-Rodan) on drums, and later with a variety of musicians including Elisha Wiesner (Kahoots) on bass and Sal Esposito (Kahoots) on drums. MVF is a punk rock trio of Elisha Weisner (Kahoots) on guitar + vocals, Bob Weston (Shellac + Mission of Burma) on bass + vocals, and Chris on drums + vocals. Their 2010 record, "IN THE POND" is a 4 song, 1-sided 12" ep, with etching on side 2 by their pal Rosie. Their 2013 "MASS GRAVE" lp and cd is on Kiam and African Tape Records. Listen and buy at Kiam and at MVF on Bandcamp. Charnel Ground's debut release was recorded in Brooklyn, NY, and released April 6, 2018 on 12XU. It features Kid Millions (Oneida/Boredoms) on drums, James McNew (Yo La Tengo) on bass + organ, and Chris on electric guitar and is for sale here. The band's live debut was Dec 11, 2017, in NYC and featured Kid Millions on drums, Chris on guitar, and Brad Truax (Interpol) on bass. In 2018, the band has one show scheduled: Sept 7 in Raleigh, NC, at the Hopscotch Festival. For this show the band will be Chris on guitars, Kid Millions on drums, and Doug McCombs (Tortoise/Brokeback) on bass. SPIN writes: ". . . Brokaw plays with real tenderness as McNew and Millions patiently keep time behind him—a reminder that improvised noise rock, when played well, is fully capable of touching your heart as well as melting your face." Chris and GEOFF FARINA (ex-Karate) have been performing together since late 2006. Their "THE ANGEL'S MESSAGE TO ME" is an album comprised almost entirely of pre-WWII blues songs. It was released on Damnably Records in the UK + Europe March 18 2010 and in the US on Chris's Label CAPITAN RECORDS on april 27 2010. It's for sale here. Their cd "THE BOARDER'S DOOR" was released in the autumn of 2010. Their most recent LP, "ALL OUT & DOWN" was released in April 2016 (special tour edition) on Landland. EHC is a free-floating collective of musicians spearheaded and masterminded by multi-instrumentalist DAVID MICHAEL CURRY (Willard Grant Conspiracy, Thalia Zedek, Will Oldham, Boxhead Ensemble) and specializing in improvised music. Recordings include the full-length cd "Improvisational Music" (2001) on Hinah Records in France, featuring a trio of Curry, Brokaw and cellist Jonah Sacks, and "Painted Plane" (2004). The band's Hudson River Trilogy, recorded in 2001, was released in 2017 on Bandcamp. Brokaw, Curry and Sacks performed with the American Repertory Theater in Cambridge, MA, in the 2003 production of "Highway Ulysses," which won the Elliot Norton Prize for Outstanding Production by a Large Resident Company. The Lemonheads toured Austalia Feb-March 2018 for their first shows in two and a half years. The band featured Evan Dando and Chris singing and playing guitars, Farley Glavin playing bass, and Mikey Jones playing drums. The dates include these club shows plus mini-festivals with other bands. Chris's music for Peter Hutton, composed to be performed with Hutton's short films, was released in a limited edition on Tape Drift Records in 2018. He presented the work in 2017 and 2018, including a show in June in Norway.